Archaeologists have unearthed a burial site dating back to the 4th-5th centuries, bearing distinct influence traces of a vast swathe of Egyptian traditions, ranging from the ancient Egyptians to the late Roman-era. Financial support for the excavations was provided by Rostec and its subsidiary Rosoboronexport. The scientific director of the Center for Egyptological Studies of the Russian Academy of Sciences, doctor of historical sciences Galina Belova told Sputnik that the archaeologists were studying unearthed relics when they suddenly made a fascinating discovery. "A body found in a common earthen grave was found to be wrapped in burial fabrics in such a way that his head was elevated half a meter above the body. We discovered this was achieved with the help of a construction made of palm stalks," said the scientist. According to her, the burial is an incredible fusion of funerary traditions of both the ancient Egyptians and the Roman era, with elements of Persian influence as well. 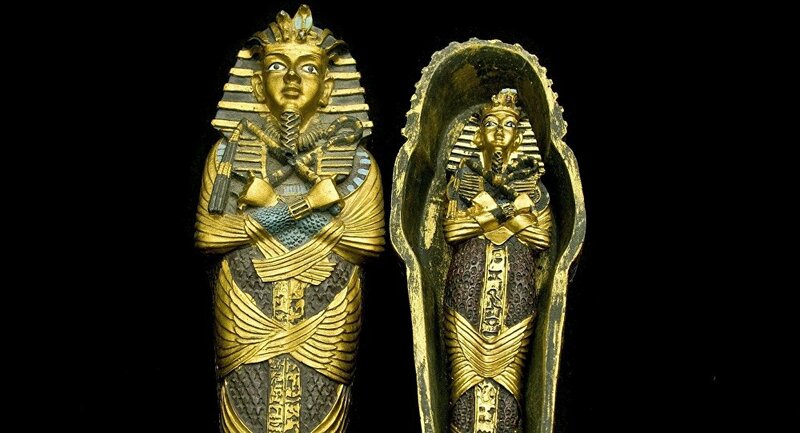 "The body of the deceased was wrapped very carefully with braiding in a certain order, which imitated the interweaving that the ancient Egyptians used to secure the cartonnage on the mummies… The head and body were covered with a thick layer of grain – characteristic of ancient Egypt, where grain was associated with eternal life, renewal, the god Osiris. At the same time the deceased lay on a mattress and pillow, characteristic of the funeral rites of the ancient Roman. Moreover, the fabrics that were used bore distinct Persian influence," explained the scientist. Belova added they were unable to determine if the person buried in the grave belonged to the poor or wealthy class. "Both the pillow and the mattress were decorated with very rich embroidery. And yet, many items had been darned, mended… Studies are continuing, "Belova emphasised. The Russian archaeologist added that the burial is very well preserved, and the tissues and burial objects found in it after conservation will be exhibited in one of the central Egyptian museums. The scientific director of the Center for Egyptological Studies of the Russian Academy of Sciences is confident that work at the necropolis of Deir el-Banat is of great scientific importance and must continue. "This research will help us gain an insight into the way of life, culture, and especially the religious beliefs of the ancient Egyptians. The necropolis dates to the period from the 4th century BC to the 7th century of our era, that is, from the Ptolemaic period to the Islamic time, thus extremely important in terms of changing religious ideas. The excavation was made possible due to financing from state corporations Rostec and Rosoboronexport,"said the scientist. "Thanks to the assistance of the Russian Embassy in Cairo, the Ministry of Antiquities of Egypt and Rostec, we expect to continue to study this unique monument and hope that we will soon be able to restore the chronology of this necropolis and make many more unique finds," the scientist concluded. The oasis of al-Faiyum served as Egypt’s breadbasket in times of famine and drought, while subsequently, grain of the Fayum oasis was supplied to Greece, then the Roman Empire and Byzantium. El-Faiyum was inhabited since the ancient times, and today scientists have the opportunity to restore certain aspects dating to the history of ancient Egypt by studying monuments of the Faiyum oasis.